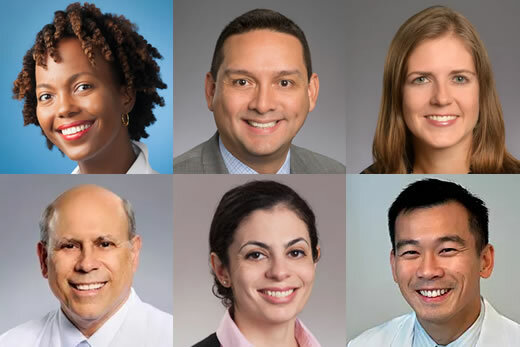 Clockwise, beginning top left: Khaliah Johnson (Pediatrics), Kenneth Cardona (Surgery), Colleen Kraft (Pathology & Laboratory Medicine), Steven Yeh (Ophthalmology), Bisan Salhi (Emergency Medicine), Jonathan Masor (Dept. of Medicine). The full list of doctors who were recognized can be found on the Emory Doctors Day 2017 web site. All the doctors recognized in 2017 along with quotes from colleagues, given in their nominations. In the run-up to Doctors' Day 2017, the Recognitions Committee at Emory University School of Medicine sent out a call for nominations for doctors across the school who "go above and beyond." When nominations had been counted, over 160 Emory physicians were nominated by their peers and colleagues for their dedication to improving the health and well-being of patients and community through the care they provide, the research they conduct, and their efforts to teach and inspire learners. The recognition committee subsequently reviewed all nominations and selected those individuals who exemplify the outstanding faculty of the Emory School of Medicine. The list of recognized doctors was posted to a Doctors Day web site, with each doctors photo and name appearing along with quotes from the nominations that landed them on the list. The web site is: 2017doctorsday.strikingly.com. National Doctors' Day was first observed in 1933 in Winder, Georgia. The date of March 30th was chosen because it marks the anniversary of the first use of general anesthesia in surgery. On March 30, 1842, in Jefferson, Georgia, Dr. Crawford Long used ether to anesthetize a patient, James Venable, and painlessly excised a tumor from his neck.